David L. Mills has always liked to tinker. At the age of 6, he was making model airplanes using balsa wood and an X-Acto knife. By age 9, he was disassembling the family telephone, and in 1955, at 17, he built a radio out of a cuff link box and some transistors his father had given him. More than 20 years later, Mills would be instrumental in building something else — the Internet. It all started with the U.S. Department of Defense through its research arm, the Advanced Research Projects Agency, or ARPA (later, the acronym would be changed to “DARPA”). Under the increasing tensions of the Cold War and the stockpiling of weapons, the agency sought to create a national computer network that would continue to function even if a major portion of it were wiped out in a nuclear war. According to Mills, ARPA was looking for a way to talk across three main communications technologies: landlines (ARPANet), satellites (SATNet, which linked the U.S. and Europe) and packet radio, a device that transmits and receives data via short-range radio. It was 1977. “Networks were expensive central processors; we wanted to take a dumb terminal and access a smart computer mainframe. That’s how the Internet was born,” he recalled. Mills served on several national panels and advisory groups. He chaired the Gateway Algorithms and Data Structures Task Force (GADS), the precursor to the Internet Engineering Task Force which develops and promotes Internet standards, and was the first chairman of the Internet Architecture Task Force. A self-professed “Internet grease monkey,” he played an essential role in developing the gateways and protocols — the rules of the road of data transmission, if you will — that provide the backbone of today’s information superhighway. His specialty? Routing protocols. “I wanted to send electronic mail, but in order to do that I had to write the software protocols. We wanted to teleconference rather than travel to meetings; we wanted to connect networks together, so we had to write the software,” he explained. 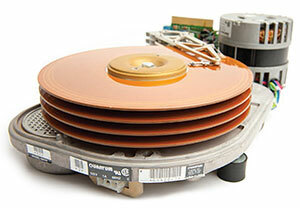 When the Fuzzball was in its heyday, it could route 300 packets per second. Today’s routers handle 1.3 billion packets per second. One well-known example is the Fuzzball router, an inexpensive mini-computer loaded with software written by Mills. Each Fuzzball was connected to SATNet, providing a network link that Mills and his colleagues used to research, experiment and test the protocols and technology they were developing. “There were nests of Fuzzballs across the globe in the U.S., England, Germany and Italy,” Mills said. Later, they also would be used in early National Science Foundation (NSF) internetworks connecting university and research campuses to the Defense Department’s ARPANet. Mills also actively participated in the evolution of the Internet protocol (IP), transmission control protocol (TCP), file transfer protocol (FTP), simple mail transfer protocol (SMTP), Telnet and other standard methods of data transmission upon which modern researchers and the world’s Internet users rely. On his watch were gateway architecture, network and internetwork routing algorithms, subdividing IP networks and “growing pains” — which often meant working all hours of the day and night, and traveling across the country and Europe to collaborate with others involved. “If it didn’t work, the fickle finger would point to me,” he smiled, recalling many a night sprawled on his office floor, waiting for phone calls alerting him to the latest problem. In particular, his Network Time Protocol (NTP) was essential to the early development of the ARPANet, precursor to the modern Internet. The protocol enables precise time synchronization, which is critical to the accuracy of electronic feats such as air traffic control coordination, online experiments, stock-market buy and sell orders and streaming video on the web. Meanwhile, Dave Farber arrived on campus in 1977 with an ARPANet Interface Message Processor (IMP), the predecessor of the modern-day network router, and an ARPANet connection. UD was among only a small number of universities that had an ARPANet connection. In the early 1980s, researchers at academic institutions across the nation and overseas wanted to talk to one another. In a small computer science laboratory in DuPont Hall, Farber, now Distinguished Policy Fellow of Electrical and Computer Engineering, and a small cohort of students and faculty operated the first global “post office” for academic email. “Delaware was the central hub in the early days of academic networking. 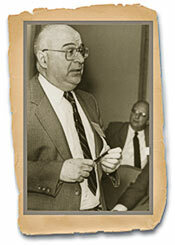 You didn’t talk to anyone in the academic world without going through Delaware,” Farber explained. UD set up mail servers using telephone lines and the ARPANet so that academic institutions across the nation could dial in to drop off or receive messages as often as they were willing to pay for phone calls. The result was CSNet — a computer science network designed to tie universities together. Plugging into a high-speed network requires an adapter, an Ethernet card. 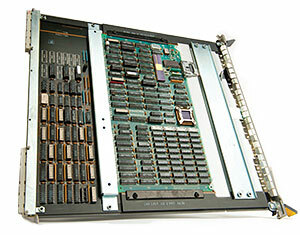 A first-generation card shown here is 17-by-15.5 inches and cost from $1,500 to $3,000 in the mid-1980s. All of today’s computers include this card’s equivalent Ethernet circuitry as just a small fraction of a single chip. Bob Caviness, then chair of computer and information systems, and Peter Warter, then chair of electrical and computer engineering, supported and encouraged the project, according to Farber. CSNet worked on a relay system. A school would dial into the UD computer, establish a telephone connection and download all email desired to UD. Then UD faculty and students collected and delivered the mail from multiple institutions. “My student, Dave Crocker, sometimes stayed up 24 hours a day managing the relay,” Farber remembered. When word got out, Farber and his colleagues were delivering email to 500 sites daily, including foreign countries. They quickly realized the critical value of electronic correspondence. “Each time the system went down for repair, within minutes our phones were ringing off the hook with people from all over the world saying, ‘we sent you something and you haven’t replied, what’s wrong?’ ” he continued. Farber’s team was also among the first to recognize privacy issues associated with email and develop tools to debug email without viewing the contents. As students graduated and began working, industrial research laboratories also began clamoring for email access, Farber noted. Tech giants like Bell Laboratories, IBM and Hewlett Packard, among others, were willing to pay for connectivity, as were a number of academic institutions. Farber responded by extending the mission of CSNet to include industry, lowering the cost to academia. 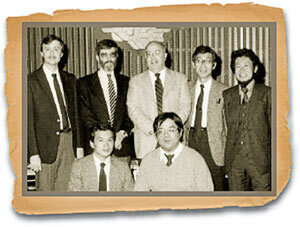 David Farber (center, top) was among those who helped Japan connect to the Internet. The project involved 380 schools in the United States and 30 countries around the world. Early users overseas included Japan, China and Russia. South Africa, which recently celebrated two decades of having the Internet and acknowledged UD, was among the last to join as the Internet was coming into popular use in the late 1990s. “Our role was to generate ideas on how email could work, set the direction and formulate the needed infrastructure; then train students who would carry on afterward,” said Farber. As organizations began demanding quicker service, permanent links and phone lines, the Internet became commercialized and CSNet faded into the background, replaced by NSFNet, a collection of regional networks. UD was part of SURANet which was built under the auspices of SURA, the Southeastern Universities Research Association. Networks in other regions, including NYSETNet in New York State, NEARNet in New England, JVNCNet in New Jersey, among others, were interconnected to form the national NSFNet. At UD, Daniel Grim was an early proponent of Internet and Ethernet technology, promoting their use and adoption on campus. “One requirement of participating in the national network was to deploy networking technology on the campus,” he said. Up until then, the only networking at UD connected the computing center in DuPont Hall to the electrical engineering and computer science departments. 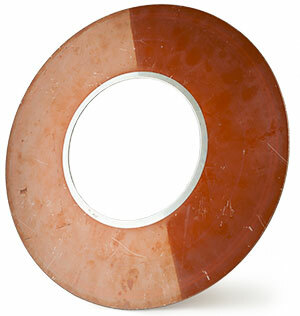 This 14-inch-diameter hard-disk platter, used in the 1970s, could hold 2 megabytes per side. It would take two of these platters to store Led Zeppelin’s classic song “Stairway to Heaven.” Today we store entire music libraries on devices no bigger than a deck of cards. Grim, who today serves as the University’ chief technology officer, chaired UD’s Network Planning Task Force charged with developing a plan to construct a campus-wide network. The task force delivered its report in 1989 and implemented a network that reached key locations around campus in the early 1990s. Today the network extends to every building on every campus across the state. While Mills and his colleagues suspected early on that the Internet would be huge, he admits to periodically worrying that the Internet was growing too fast; that computers were not big enough and that lines were not fast enough to handle the volume. In the mid-1990s, thinking surrounding the Internet began to shift. Networking people began to consider more than simply connecting the networks together; they pondered how to enrich the infrastructure and transfer the technology to public use. The main challenge, Mills continued, was could they “reach the time when the sun never sets on the Internet protocol.” On February 8, 1994, they succeeded, when the South Pole received its first Internet connection. Adam Osborne, who received his master’s and doctoral degrees in chemical engineering at UD in 1966 and 1968, respectively, is credited with introducing the first portable computer to the world, when he presented the Osborne 1 at the West Coast Computer Faire in June 1981. About the size of a suitcase and equipped with a carrying handle, the 24-pound Osborne 1 Personal Business Computer featured a five-inch display screen and included WordStar, a word processing package, and SuperCalc, a spreadsheet program, among other software. Selling for $1,795, the machine with its novel bundled software would launch the personal computer industry. Osborne Computer Corporation had its first million-dollar sales month in September 1981. In 1982, sales reached about $70 million. However, with stiff competition from IBM and Apple, coupled with Osborne’s premature bragging about a coming model months before it could be released, which caused stores to cancel orders for an existing model (a phenomenon now known as the “Osborne Effect”), the company declared bankruptcy in 1983. Osborne did much to spark the computer revolution. Even before the Osborne I was invented, he had founded a publishing company that produced easy-to-read books on computing; he wrote many of them himself. The company was later sold to McGraw-Hill, which established McGraw-Hill/Osborne, specializing in computing books. Osborne died in India, his childhood home, in 2003. Did you know that the multi-touch technology used in electronics like the iPhone and iPad originated at UD? Electrical engineering professor John Elias and alumnus Wayne Westerman (Ph.D. 1999) developed the groundbreaking computer interface technology in 2000. While advances in power, speed and memory had improved computing capabilities over the previous three decades, theirs was the first product to revolutionize the user interface. Originally called “multi-touch” because it used a touch pad and a range of finger motions to communicate commands and keys to the computer, the technology employed “zero force technology,” to reduce stress injuries such as tendonitis and carpal tunnel syndrome attributed to traditional computer work. Their startup company, FingerWorks, commercialized the technology and sold it to Apple Inc., in 2005. In 2000, Guang Gao, Distinguished Professor of Electrical Engineering, and his associates founded ETI, a UD-start up and high-performance system software company. It provides solutions and tools for advanced computing architectures and platforms based on new microprocessor chips that run at faster speeds thanks to multiple “cores,” or copies of processor circuitry. 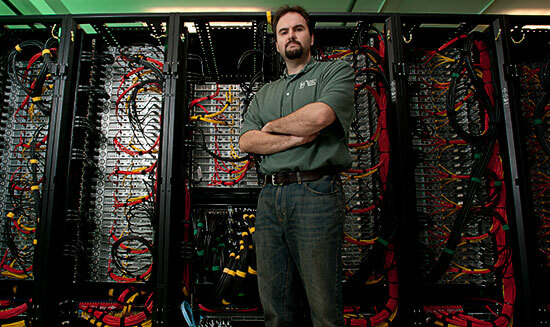 ETI’s system software applies many-core chip technology, with 160 processing cores on a single chip designed by IBM, to power the world’s most influential supercomputers. UD alumnus Roger Craig leaped to Jeopardy! quiz show fame in 2010 when he set the all-time record for single-day winnings ($77,000). He also became the show’s fourth-highest winning contestant ever. To prepare for the show, Craig created a data mining software application. Today, he is the co-founder and CEO of Cotinga LLC, a predictive analytics consulting firm based in New York City that markets this software for other applications. Jeff Frey, systems programmer in UD Information Technologies, with the Mills high-performance computing cluster. he 5,000-processor, high-performance computing cluster that hummed into operation at UD early this year has been named “Mills” in honor of the professor emeritus and Internet pioneer. “The University of Delaware is proud to name its new computing cluster in honor of Prof. David L. Mills, whose influence on and contributions to computing, networking, and computer engineering at the University and whose contributions to the development of the protocols behind the Internet itself cannot be overstated,” said Carl Jacobson, vice president for Information Technologies (IT). Mills is the first in a series of high-performance computing clusters that IT plans to build collaboratively with UD faculty to improve research computing, Jacobson said. Assembled by Penguin Computing, the cluster features 200 compute nodes with 5,136 processor cores, over 14 terabytes of RAM, and about 200 terabytes of disk space. Fifty faculty stakeholders from 19 different UD departments or research centers purchased the compute nodes, and IT funded the storage, switch, maintenance, and physical and staff infrastructure. Dion Vlachos, Elizabeth Inez Kelley Professor of Chemical Engineering and director of the Catalysis Center for Energy Innovation, said the Mills cluster will help the center develop sustainable energy applications. “The simulations run on the cluster will facilitate the design of new catalysts to enable chemical transformations that can turn biomass into valuable plastics and fuels,” Vlachos said. Gregory A. Miller, professor and chair of the Department of Psychology, anticipates that the Mills cluster will aid his research on brain mechanisms in human cognition, human emotions and mental illness. Edward G. Jefferson Chair of Bioinformatics and Computational Biology and director of the Center for Bioinformatics and Computational Biology, is leading research to sequence the genome of a fish called the little skate (Leucoraja erinacea). It is one of 11 non-mammalian organisms selected by the National Institutes of Health (NIH) as a model for human health research. Native to the east coast of North America, the little skate shares key characteristics with the human immune, circulatory and nervous systems. But this sea creature has a very important capability we do not have. It can re-grow body parts after they are injured. Wu and her UD team are part of a regional collaboration working to map the little skate’s genome in hopes of unlocking the secrets of this regenerative ability for the benefit of humans. The Little Skate Genome Project is part of the North East Cyberinfrastructure Consortium (NECC), which was formed in 2007 to build critical cyberinfrastructure and expertise in bioinformatics in its member states, which include Delaware, Maine, New Hampshire, Rhode Island and Vermont. To date, more than 100 NECC researchers and students have contributed to the little skate’s genome sequencing and annotation through a series of bioinformatics training workshops held at UD and Mount Desert Island Biological Laboratory in Maine and annotation jamborees held online across partner institutions. The project has supported recent articles in Science, the Proceedings of the National Academy of Sciences and Database: The Journal of Biological Databases and Curation and has produced a community resource, Skatebase (skatebase.org), for broad dissemination of the genomic data and bioinformatics tools to the biomedical research community. 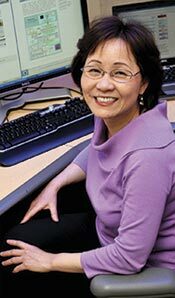 professor of computer and information sciences, recently was selected as a “distinguished scientist” by the Association for Computing Machinery (ACM), the world’s largest scientific and educational computing society. Pollock is leading research in software analysis to improve software testing and maintenance tools for software engineers, and collaborating on research in green software engineering. Yet her influence extends far beyond the computer lab. 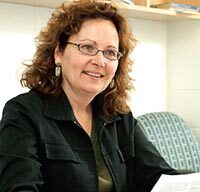 Pollock has devoted much of her career to broadening the participation of women in computing and its research opportunities by organizing career mentoring programs and workshops through the Computing Research Association’s Committee on the Status of Women in Computing (CRA-W), and the Grace Hopper Celebration of Women conference series. At UD, Pollock is an avid undergraduate and graduate mentor who co-created, with colleague Terry Harvey, a service learning course that matches computer science student teams with middle school teachers to design learning games for XO laptops, the computers developed by the One Laptop Per Child Program. During the past year, her students devised math learning games for the Chester Community Charter School in Chester, Pa., and an English-to-Creole tutor application in Haiti to help Haitian women and their students improve their English. chief technology officer in UD Information Technologies (IT), says that upgrades to the University’s computing network is “a continuous process,” as higher speeds become available with newer technology, and network utilization continues to grow. In 2006, UD purchased a 20-year lease of a fiber-optic ring that links Newark, Del., to Philadelphia, Pa. Today, the network runs at 10 gigabits/second, carrying all of the University’s traffic to the Internet (Internet 1) as well as to Internet 2, an advanced networking consortium led by the research and education community. Plans are under way to upgrade the network’s equipment to carry multiples of 10 gigabits/second using the same optical fiber (up to 880 gigabits/second). “We are also upgrading the speed of the network ‘backbone’ from one gigabit/second to 10 gigabits/second this year, and ultimately to 40 and 100 gigabits/second in the future as demand dictates,” Grim says. The Mills high-performance computing cluster, launched earlier this year, is the first in a series of clusters planned by IT to help advance the University’s research mission. Prior to joining the UD faculty in 2002, Leonard Cimini, professor of computer and electrical engineering, spent 20 years at Bell Labs and AT&T Labs in Monmouth County, N.J. His early work, from 1982–1985, established the first real application of orthogonal frequency-division multiplexing (OFDM) to wireless systems. Today, OFDM is a mature technology used for wide band digital communication in applications relating to wireless networks, mobile Internet access and next-generation cellular systems. In 2010, Cimini was recognized with the Innovators Award from the New Jersey Inventors Hall of Fame for his critical role in high-speed wireless communication. For more than a decade, UD has been a charter member of Internet2, www.internet2.edu, a consortium of 221 universities in partnership with industry and government, that is developing new applications and services to meet the needs of researchers and educators, including a 100 gigabit/second network. This advanced network connects more than 66,000 institutions in the U.S. and international research networks representing more than 50 countries. 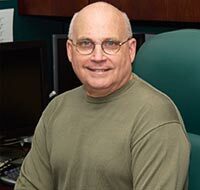 Mark Laubach, who earned a bachelor’s degree in electrical engineering and a master’s degree in computer science from UD, is a key figure in modern international cable modem technology development. Laubach devoted more than 14 years with the Hewlett-Packard Company to Internet and broadband technologies, services and standards. He conducted research instrumental in the high-speed use of TV cable networks, the focus of several companies he co-founded. From 1986 to 1995, UD alumnus Walter David Sincoskie led the world’s leading switching research organization at Bellcore, which spearheaded the telecommunications transition from circuit-switching to packet-switching, a key factor in the Internet’s successful commercialization. From 1996 to 2008, he was senior vice president of Telcordia’s Networking Systems Laboratory where, among other achievements, he pioneered the creation of Internet telephony — the use of the Internet to make voice calls. 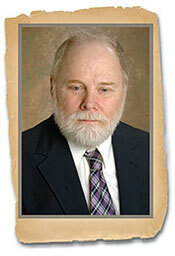 Sincoskie made many seminal contributions to the science and technologies of communications networks, according to UD’s Dave Farber, who was his doctoral adviser, including the first voice-over-packet phone, first virtual local area network (LAN), first description of a digital video server and first wide-area gigabit computer network. Sincoskie received his bachelor’s, master’s and Ph.D. degrees in electrical engineering from UD. He joined the UD faculty in 2008. Sadly, he died unexpectedly in 2010. Edward Szurkowski, founder and managing partner of Blue Mill Group, is a pioneer in networking applications. Previously, he was vice president of the Wireless and Broadband Access Research Center at Bell Laboratories, Alcatel-Lucent, in Murray Hill, N.J., where he led development of new products and services in wireless, optical and data networking, satellite systems and software. Szurkowski received bachelor’s, master’s and doctoral degrees in electrical engineering at UD and now serves on the UD Department of Electrical and Computer Engineering Advisory Board. 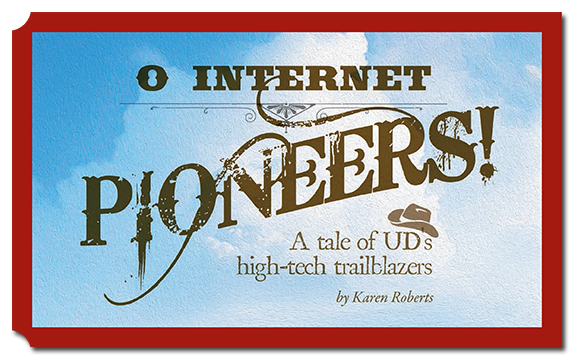 UD students have helped to develop Phoebus, the “architectural evolution” of the Internet. The brainchild of Martin Swany, former UD professor now at Indiana University, Phoebus improves network performance by enabling Internet2 to transparently switch large data flows (high-demand applications) from its IP (internet protocol) network, shared among all Internet2 users, onto dedicated circuits or paths. It is expected to play a critical role in major scientific projects that require high-performance networks to connect researchers.